A superb, large, Ernest Gimson design, Cotswold School oak chest of drawers; with two short over three long drawers. 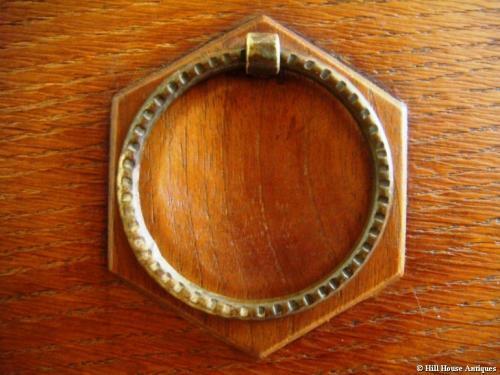 Alfred Bucknell (Gimson`s blacksmith) designed punched ring handles on unusual walnut hexagonal backplates; c1910. Similar Gimson chest designs exist in the Cheltenham Art Gallery & Museum archives. Edward Barnsley also used similar wooden hexagonal backplates with Bucknall ring handles in some of his early work.